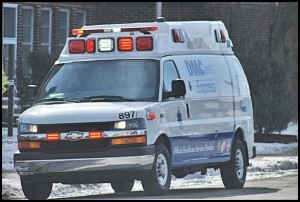 Hamtramck firefighters claim that ambulance service being provided by Detroit Medical Center is inferior to their service. Acting City Manager Kyle Tertzag disagrees, saying the city is actually getting better service. Hamtramck firefighters are firing back at city officials over who should provide ambulance service. Acting City Manager Kyle Tertzag recently took the department’s two ambulances out of service to find out what repairs are needed to the aging vehicles. In the meantime, he has contracted Detroit Medical Center to provide ambulance service. Tertzag took that action when it was reported that one of the department’s ambulances would not start after picking up a boy who had stopped breathing. Ambulance personnel were forced to turn to a neighbor of the boy to take him to a hospital. Firefighters want the ambulances back in business. “For the fastest, most efficient EMS service possible, it is crucial that our public officials put our ambulances back in service. Hamtramck residents deserve no less, and to keep this city’s ambulances out of service does not represent a commitment to public safety,” Hamtramck Firefighters Association President Matt Wyszczelski said in a press release. Still, firefighters insist the city should put the ambulances back in service as soon as possible. Out of the department’s approximately 3,000 runs per year, Fire Chief Paul Wilk said 80 percent of them are for ambulance service. Tertzag said that despite claims by the firefighters that DMC won’t respond in a timely fashion, an ambulance is stationed in Hamtramck – at Holbrook and Conant – at all times. “This is just another phony scare tactic that the union unfortunately has resorted to,” Tertzag. As for the quality of service, Tertzag said the community will actually receive improved care because DMC provides crews with advanced training. “We’re getting an upgrade,” Tertzag said. What’s at the heart of the issue is a demand from the city for the union to agree to deep contract concessions. Tertzag said he needs the union to agree to $1.2 million worth of concessions. Firefighters do not contribute any money to their health insurance nor are they required to pay deductibles for office visits or prescriptions. Firefighters have presented concessions worth $500,000. Tertzag said he is still verifying that amount. Tertzag said he is under instruction from state Treasurer Andy Dillon to get concessions from the firefighters before the state will approve the city’s budget deficit elimination plan and a request for an emergency $3 million loan. The city is facing a $3 million budget deficit, and so far has skipped paying into the city’s pension fund to avoid payless paydays. The city owes $1.2 million to the pension fund. Is it possible that approx. 7 years ago when,as a cost savings concession by the Firefighters Union,the city eliminated the position of Master Mechanic in the HFD this problem started??? YES!!! Up until that time The HFD had a full time mechanic working on all the trucks doing maintenance and there was never a time when a breakdown affected the departments ability to provide the service which was required of them. Prior to 2000 the Master Mechanic did ALL repairs on ALL vehicles including major repairs such as transmission and engine work at a great savings to the city. In 2000 the DPW was eliminated by the EFM and the ability to do MAJOR repairs was contracted out due to the fact that the large tools and hoists needed to perform such large jobs were only available at the public works garage. Place the blame wherever you want for the city no longer having their own ambulance service but at least admit that without proper repairs and maintenance ALL machines will fail! So now the rigs are breaking down….And the City thinks they are saving money by contracting the ambulance service to a private company. Ask yourselves this….If a private company is in the business of making money and the one ambulance they supposedly have in Hamt 24/7 has the opportunity to make money on a run outside the city,do you think they will allow that rig to sit in Hamt??? NO!!! they will dispatch that rig anywhere it needs to go to make money for the company. As far as the city getting the ambulance service for free. That’s a good one! When the F.D ran the ambulance service the city COLLECTED money for the service and you can bet that ANY ambulance service used in the future will send you a bill if and when you need them! Nothing is free! But at least when the money was collected in the past it went to the City,not a private company. Also I know that over the last 25 years or so the E.M.T.s in Hamt have faced gunfire on at least 5 separate occasions to give aid to injured citizens. I for one went into a vacant field to pull a child with a gunshot wound to safety before the Police were even on the scene. Do you think an responder from a private company will risk their lives in that manner? I doubt it. The saying is…”You get what you pay for”….For years the citizens have gotten much more than that. Getting what you pay for will become very evident in the near future.